The Singapore Sports Hub will reveal its calendar of events for 2014 today. Apart from being home to some of the world’s biggest sports stars, the fully integrated sports, leisure, entertainment and lifestyle arena will also be a playground for Singaporeans when it opens later this year. Tien Chung Ping, Tay Chern Hui, Chng Choon Hiong and Bryandt Lyn offer a sneak peek of what to expect from the new attraction. Set to have the world’s largest free-spanning dome, the Singapore Sports Hub will be an iconic addition to the country’s skyline when it is fully open in June. Standing at 82.5m tall when the dome is fully closed – high enough to fit Changi Airport’s control tower inside – and with a diameter of 310m – large enough to house four A-380 planes parked wing to wing – the $1.33 billion hub is one of the most architecturally challenging and technologically advanced projects to be constructed in Singapore. When completed, the new National Stadium’s movable 55,000-capacity seating tiers will allow for flexible movement inside the stadium bowl, making it the only stadium in the world suitable for hosting football, athletics, rugby and cricket, as well as concerts. The stadium, one of the few carbon-neutral ones around, is installed with energy-efficient cooling technology, where cool air at 23 deg C is pumped from underneath the seats. This additional energy required is offset by energy harnessed throughout the year by solar panels, which has zero impact on the environment. Sustainability has been central to the design of the Sports Hub from the start. The insulation in the roof cladding and giant louvres, for example, minimise the heat from the sun. The project was awarded the Green Mark Gold Plus for its sustainable design of the stadium and Sports Hub precinct. The hub is also home to a 6,000-capacity indoor aquatic centre, a 3,000-capacity multi-purpose indoor arena and a water sports centre featuring dragon boating, kayaking and canoeing in the Kallang Basin. There is also a 41,000 sq m retail and waterfront area as well as a sports museum and sports library. All these are just minutes’ walk from two MRT stations – Kallang and Stadium. 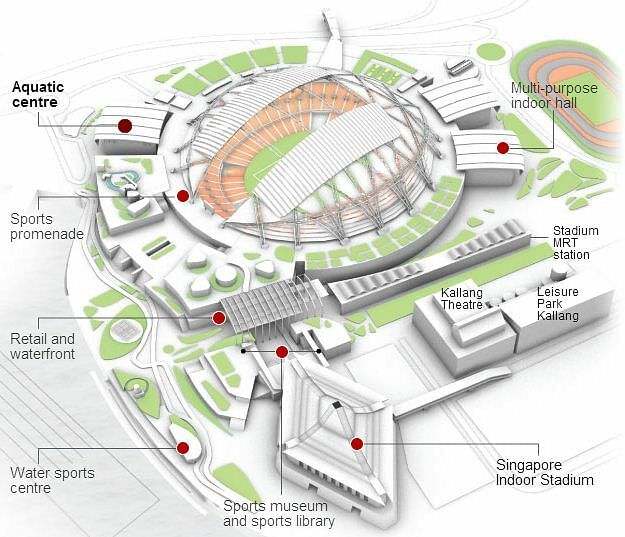 The hub will be home to Singapore’s elite athletes and some of the world’s best sportsmen. But with facilities such as courts for volleyball and basketball, facilities for lawn bowls, a skate park, a climbing wall as well as running and cycling circuits, you do not have to be a professional athlete to enjoy these offerings. The Singapore Sports Hub will be a place where Singaporeans can shop, play, cheer and roar under one roof.